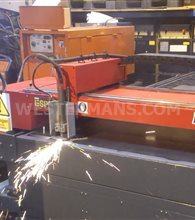 Esprit Automation manufacture in Britain a range of Esprit CNC Oxy-fuel and Esprit Plasma Profile cutting tables. We supply these used and refurbished saving time and money against buying a new cutting system. Our fully serviced or refurbished machines are supplied with our own warranty and after care support. Installation and commissioning can also be provided. Maybe you are looking to upgrade from a cnc plasma cutting machine to a Laser cutter? We will offer you the best price for the Esprit plasma cutter you are looking to sell. Contact our Buying Team for a price. 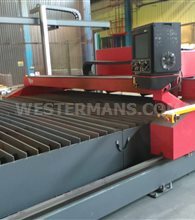 Looking for a Used or Refurbished CNC mechanised Plasma Cutter from a British maker? Esprit Automation of England make quality CNC Cutting tables adding Hypertherm plasma systems to compliment the range. 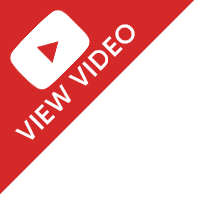 Buy from us and benefit from top quality, reliable UK brand which is built to perform for the professional whilst saving on the cost of a new machine. Our fully serviced and refurbished machines are supplied with warranty and after care support. Installation and Commissioning can also be provided. Any workshop wants a reliable great performer to keep up with orders and production whilst keeping costs to a minimum. Use our search facility on the right to locate all used and Esprit Plasma machines in stock today or call us for current stock. Extended warranties and Service Packages available with every machine purchased. Not sure? Then consider rental of a CNC Profile plate cutter first. Ask the Hire Team for more details. Esprit CNC machines are designed to fully exploit the latest in plasma cutting technology. Our engineering and design team use the latest techniques and software to fully 3D model every machine prior to manufacture; this attention to detail ensures the machines are manufactured accurately and in turn can deliver the very highest in performance and quality. All machines are engineered for heavy duty applications and built to last. All current models feature the latest Hypertherm EDGE Pro CNC which is digitally integrated using Ethernets with Bosch brushless AC servo drives and motors, precision Swiss gearboxes and machine tool grade THK linear bearings to produce the smoothest high speed contouring. Esprit machines are fully optimised for high performance plasma cutting and oxy-fuel flame cutting. With worldwide clients we are always seeking to buy Esprit machines. Please offer us surplus or unwanted plasma cutters. Esprit Lightning HD machines are precision compact-bed machine tools for high-precision plasma cutting and are available in a range of popular sizes from 3.0m x 1.5m upwards. Designed on laser cutting machine principles, the Lightning HD fully exploits the latest Hypertherm HPR XD plasma cutting processes and produces clean, square, dross-free cuts on a wide range of ferrous and non-ferrous metals. High-power digital AC drive systems with precision gearboxes and dual direct-drive rack and pinions in the X axis and direct-drive rack and pinion in the Y axis produce smooth motion with high speed and acceleration. Twin hardened and ground linear bearings in both axes mounted to fully machined heavy-duty fabrications provide high accuracy and repeatability. The Lightning HD can be specified with one or two Hypertherm HPR XD Torches. 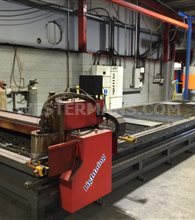 Esprit Viper machines are large-bed CNC portal cutting machines for up to eight plasma or oxy-fuel cutting stations. Designed and manufactured as precision machine tools, the Viper machines feature heavy-duty floor mounted rails, hardened and ground linear bearings, Powerful digital AC drive systems, precision gearboxes and rack and pinion drives for excellent machine performance. Cutting width can be specified between 1.5m and 6.5m; cutting length is effectively unlimited. Viper machines can be specified with Hypertherm HPR or conventional plasma cutting systems up to 800A or oxy-fuel torches for the thicker material ranges. The Esprit Multibevel machine will cut components with a range of bevel details suitable for straight and radius edge weld preps, countersinks and a range of other component specifications. The MultiBevel has an Esprit engineered precision bevel head and fully integrated True Bevel technology from Hypertherm for quicker set-up and more accurate bevel cutting. The machine will handle plates up to 50 mm thick and covers V, A, and Top-Y style cuts with ±45° limits. Secondary machining operations can be significantly reduced or eliminated offering huge secondary operation savings. The latest Esprit Lightning S machines have an innovative linked-rail design which delivers high machine stability. Thousands of hours of engineering development have produced a machine which delivers high quality and productivity not normally associated with rail based machines. The heavy duty machined fabrications combine with precision linear guidance, rack and pinion transmissions and digital brushless drives to give smooth, precise motion for the very highest cut quality. The Lightning S can be specified with a range of Hypertherm plasma cutting systems with a range of other plate cutting and marking options. Bed sizes are from 3×1.5m and can be specified up to 3m wide and 20m in length. The Esprit Cobra is a modern rail based machine and can be specified with between 1.5m and 3m cutting width and up to 12m cutting length. The Cobra can have up to two plasma cutting heads and up to six oxy-fuel flame cutting heads. Cobra machines are dual side direct rack and pinion drive in the X axis and feature linear bearings and direct rack and pinion drive in the Y axis. Hypertherm HyPerformance HPR XD plasma up to 400A can be specified with the Cobra. EDGE Pro CNC & Bosch digital brushless AC drives complete the machine specification – giving the Cobra machines smooth precision motion and high reliability. Esprit Lightning D machines produce high quality accurate components in virtually all metals. 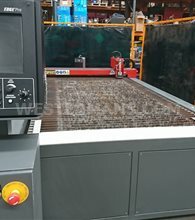 The machines are available in a range of popular sizes from 2.5m x 1.25m up to 8.5m x 2.0m and can be specified with up to two conventional or Hypertherm HPR130XD high-definition plasma-cutting units. The Lightning D machines have hardened and ground linear bearings in both axes and are available with either pneumatic plate-rider or precision arc-voltage torch height controls dependant upon the application. All have Hypertherm EDGE Pro CNC and digital AC brushless drive systems. The Esprit Arrow High-speed CNC plasma cutting system machine combines the latest digital CNC plasma cutting machine technology in a compact package and offers the best price/performance ratio in it’s class. Twin side longitudinal drive, hardened and ground linear bearings all round, digital AC drive systems and the latest inverter based plasma cutting units make the Arrow the clear choice for HVAC ductwork, general sheet-metalwork and light-fabrication applications. The Arrow shares the same advanced digital CNC technology as the other machines in the range – the Hypertherm EDGE Pro. 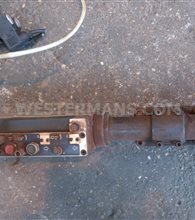 All the used or refurbished Esprit Plasma cutters in stock can be fitted with either New or Used Hypertherm Plasma cutting systems.